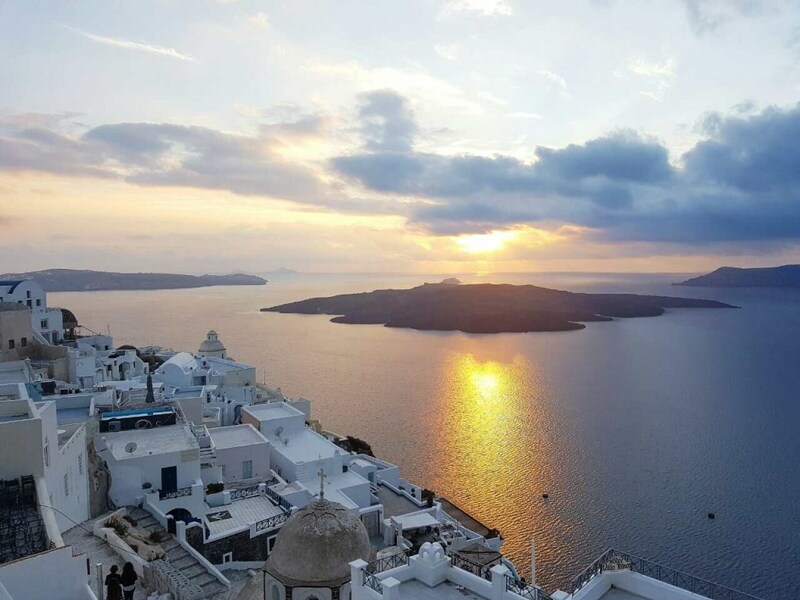 This little Cyclades island is famous worldwide because of it’s extraordinary volcanic landscape, the endless view at Aegean Sea and the magic sunsets. During summer millions of tourists visit the island in order to enjoy all the beauties and live romantic moments. We visited Santorini in winter and we will give you many reasons why you should also visit Santorini in winter. You can actually enjoy the sunset and take photos without at least 3 tourists in the picture. The island is famous for the beautiful sunsets. Let’s pretend that you want to enjoy the sunset with your other half and you take position quite early. Suddenly, you will realize that people are coming from every corner and before you fully realize it you will be in a spot with full of people and minimum view. This is a problem that you don’t have to deal with if you visit Santorini in winter. Even if someone is noisy (in our case an Indian couple having a fight) you can easily find another perfect spot. You can stay in a “cave” hotel with half the budget! The prices during summer are quite high. It makes sense because there are too many people that want to visit the island but not that many hotels. So you will pay a very expensive room which probably doesn’t deserve the money. During winter you can find the same room in half price, or even 1/3 of the price. You can enjoy fresh fish and traditional delights without bankrupt. Santorini in winter is quieter because of the fact that is low season, so you can enjoy better prices and service in restaurants. Enjoy fresh fish, fava, tomato balls and local wine. You can actually find table in any restaurant that you want, contrary to summer where restaurants are full and you need to make the tour of the island in order to enjoy a meal. Keep in mind though that some restaurants do not operate during winter, but again you have many excellent choices. So, no worries! The beauty of this beach is extraordinary. It is actually red! Now think that you arrive at the beach and is full of people. You can’t even spot a place to leave your beach towel. During winter you will meet just a few tourists who take photos and leave from the beach. So if you have a sunny day take a pic-nik, enjoy the sun and admire the red rocks. The truth is that you can’t swim because is winter, but again who visits Santorini for the beaches? Learn some history and discover a city from the 16thcentury BC. See their houses, the way they lived and many other interesting facts. Santorini in winter gives you the chance to enjoy this space on your own in absolute serenity. You can walk without problems at the narrow streets of Oia and Caldera. The cute alleys take your breath and heart away. Think yourself walking around, getting lost and discovering the beautiful view in every corner. Now make the same thought with many many people around you. You can’t relax, sometimes you can’t even walk free! Santorini in winter is not full so is easy to find a hotel and cheap airplane tickets without spending all your money in the bank. So if you want to organize a surprise for you love is a great idea to do it in winter. I admit that when I want to take a photo and there are people around waiting for me to take that photo in order not to spoil it, or because they want to take a photo at the same spot, I am getting nervous. If you have the same problem don’t be afraid. Santorini in winter is the perfect place for endless dreamy photos without anyone annoying you.